Since we published this review on August 5, 2007 there have been questions about our testing and results, along with suggestions for further testing. In addition there have been statements made about this charcoal which simply defy common sense. All of which prompted several updates to this review that included new tests, new results and further evidence in the way of photographs that demonstrated our results. In order to clean things up, we have overhauled this review to include the new tests, photos and results. "...Nakedwhiz (sic) is representing himself or is taken to be the self crowned authority in charcoal and other products by his �testing� and �reviews�. " "The bottom line is that we aren't professional lump evaluators. We don't claim to have any special abilities. Our reviews are obviously going to reflect our personal opinions about what makes good lump, but we hope that if nothing else, the photographs will help you form your own opinions about each brand of lump. By trying to conduct the same test on each brand of lump, we may not be able to produce absolute results, but rather results you can use to compare brands against each other. " "Please note that I did not authorize shipping any charcoal to the Nakedwhiz (sic) for testing or anything else. It was a mistake for our office to have shipped samples or boxes. " "Since I just bought a couple of boxes of your new charcoal, I�ll be reviewing it and replacing the current review when I�ve finished. Hopefully, it will be as good as the charcoal you sold in 2003." "We recently obtained two boxes of the current charcoal and once we have reviewed it, we will be replacing this review with the new results." So we are utterly baffled how three weeks later Richard Johnson could say that he did not know that we were in possession of his product, where we got it from and that we were doing a review. However, what IS important is that our readers understand that we purchased this product in good faith, under our own name, directly from Kamado. We conducted the same tests in the same way that we test and review all brands of charcoal. We stand by the results we have obtained in this review and state unequivocally that this review is a fair and faithful representation of what we observed. 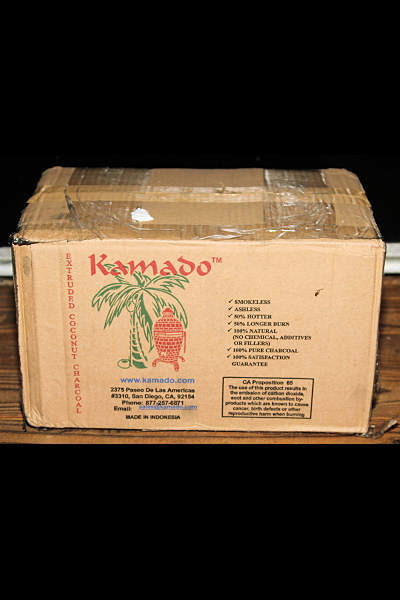 Update (08/16/09): Kamado no longer sells this extruded coconut charcoal. They are now selling coconut charcoal from another supplier. We recently obtained two boxes of the current charcoal and you can read the review by clicking here. The old pieces were about 1-3/4" long. The new pieces are just over 3-1/2 inches long. Notice also that the old piece looks hard and smooth, while the new piece looks soft and grainy. The old pieces were slightly bigger in diameter and more uniform. They both have a hole in them. Notice how the old piece cross-section looks more granular, while the new piece looks more powdery. While the 7.7% unusable chips and dust would fall into the "Low" category for lump charcoals, the old charcoal arrived with no broken pieces and only a miniscule amount of dust in the bottom of the box. To compare, the box of this new charcoal contained 590 grams of dust and chips. The box of 2003 extruded coconut that we opened for this review contained only 10 grams of dust. This new charcoal is much more fragile and subject to breaking than the old charcoal. Indeed, we tried a couple of tests to see if this were true. First, we were able to easily break a piece of the new charcoal in half with our bare hands, and even into quarters with a little more effort. On the other hand, we couldn't begin to break one of the old pieces in half. We also improvised a little hammer test in which we allowed the head of a standard claw hammer fall about 6 inches onto a piece of each charcoal. The new piece shattered on the first impact. The old piece wasn't even dented after 3 impacts. We had to swing the hammer with moderate force in order to shatter the old piece. Clearly, the new charcoal is more vulnerable to rough handling than the old. 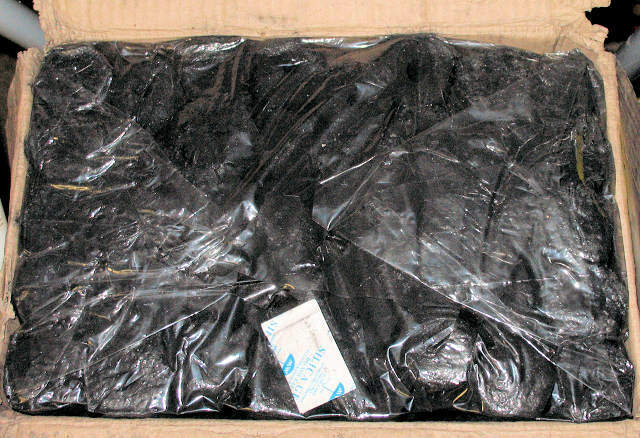 We were also able to get our hands on a box of this charcoal which had been delivered as part of a pallet order. This box was in much better shape, so it all depends on how the charcoal is handled when it is shipped to you. We suppose it also doesn't help that the boxes used for this new charcoal are less substantial than the boxes used for the older charcoal. The 2003 boxes were sturdy and had capacity and strength data printed on the bottom. These new boxes are flimsier and have no such data printed on them. The density of any solid is given by mass divided by volume. We can weigh the solid. The volume of a hexagonal cylinder is found by multiplying the area of the cross-section by the height of the cylinder. It can be shown that the area of a hexagon is equal to 3/2 times the square root of 3 times S squared, where S is the length of one side of the hexagon. So the volume is given by 2.598 x S**2 x H, where H is the height of the cylinder. To then calculate the volume of a hexagonal cylinder with a hole down the middle, you subtract the volume of the hole which is given by the area of the circle times the height of the solid, or 3.14 x R**2 x H, where R is the radius of the hole. Another observation we made is that the new pieces of charcoal seem to be less dense than the old charcoal, enough so that we decided to calculate the density for comparison. To calculate the density you merely have to calculate the volume of the solid and divide the weight of the solid by the volume. In doing so, we discovered that this new charcoal is about 16% less dense than the older charcoal. However, it is probably more important how the charcoal performs in the cooker, so let's see how it did. In the chimney starting test, where we gauge the difficulty in lighting charcoal, this charcoal took 7 sheets of newspaper to light, just like the old charcoal did. This should come as no surprise. While lighting, the charcoal has the same coconut smell, almost a little perfume to it. And of course there was no sparking or popping, as is the case with all powdered/granulated coconut charcoals. Even when lighting with a MAPP torch, there is no popping and just a hint of some sparking. In the maximum temperature test, this charcoal burned at 990 degrees, which gets it up into the "very high" category. Although it takes this charcoal quite a long time for the fire to spread and thus get up to high temperatures, it does get there eventually in a big way. Unfortunately, while this might be good for searing steaks, the way the charcoal degrades when exposed to heat, you may find that you won't be able to use much of the left over charcoal after you are done searing. Which leads us to our final observation about the fragility of this new charcoal. After the maximum temperature burn, we closed up the cooker and let the fire go out. When the cooker was completely cool, we stirred the left over charcoal to knock off ash. Much of the charcoal crumbled to powder when agitated, so a lot of the left over charcoal could not be reused. By contrast, the old charcoal could be stirred without much damage to any of the pieces and thus could be reused. Indeed, we heated up our sample of the 2003 charcoal two additional times in order to cook with it, and then we shoveled it out into a bucket to use the cooker for a test on another charcoal. The 2003 charcoal still held its shape and could be reused. Next up is the burn time test, and here we were very surprised at the results. The burn time on this charcoal was very low. In fact, it was the fourth lowest burn time of the 44 brands of lump and coconut charcoal we have ever tested. The ash production was an even bigger shock. The ash produced was the highest amount of ash produced by any lump or coconut charcoal of any type that we have ever tested. To put this in perspective, the ash produced by these Kamado coconut charcoal briquettes was higher even than that produced by Kingsford briquettes. We doubt that you could use this charcoal in many ceramic cookers for 18 to 20 hours without having to do some ash management during the cook. We were so stunned we repeated the burn time and ash testing and produced virtually identical results. We might point out that on the box, this charcoal claims to be "Ashless." As a result of the many questions about our results regarding the ash production, we conducted further tests which we documented photographically to demonstrate our results visually. In this first test, we burned equal amounts of both the 2003 charcoal and the latest charcoal. The two pieces were burned side by side, at the same time, under identical conditions. Any arguments about "open burn" and "closed burn" situations are irrelevant. The simple truth is that the new charcoal produces volumes more ash than the 2003 charcoal, and you can see it in these photographs. Notice also the marked difference in color of the ash between the two charcoals. This calls into serious question claims that this charcoal is identical to the previous charcoal, save for the shape of the briquettes. The new briquette is on the left, the old on the right. Both pieces weigh 65 grams. We cut the new piece to get the desired weight. Here you can see that they have been placed in a cooker and ignited with a MAPP torch. The cooker was closed during the test and vents opened. The pan on the left contains the larger pile of ash produced by the new charcoal, the right pan contains the old. Notice also the color difference. The new briquettes are on the left, the old on the right. Both samples weigh 335 grams. The two samples were burned side by side, at the same time. The difference in volume is even more dramatic. The new charcoal is on the left, old on the right. Next we read a claim that the ash produced by the 2007 Kamado coconut charcoal briquettes from Indonesia is no worse than Royal Oak hardwood charcoal. This statement was so amazing, we felt compelled to conduct yet another test to provide visual evidence of the incredible amount of ash produced by the current batch of Kamado coconut charcoal briquettes. This time, it's Royal Oak vs. Kamado 2007 coconut charcoal briquettes. Again, the two samples were burned side by side, at the same time, under identical conditions. As you can see, the coconut charcoal briquettes produced an enormous amount of ash compared to the Royal Oak, about 3 to 4 times greater volume. And the Royal Oak lump charcoal produced only 25 grams of ash while the new Kamado coconut charcoal briquettes produced 60 grams, or 140% more! Simply put, Royal Oak lump charcoal does not produce anywhere near the volume of ash that the Kamado coconut charcoal briquettes produce. The new briquettes are on the left, Royal Oak domestic lump on the right. Both samples weigh 385 grams. The two samples were burned side by side, at the same time. The difference in volume is again dramatic. The ash from the new briquettes is on the left, from the Royal Oak lump charcoal on the right. We found yet another statement that the 2007 coconut charcoal briquettes produce about the same amount of ash as the "old stuff." Again, this was incredible based upon our results, until that is, we realized that the comparison was being made to the 2006 extruded coconut from Thailand that Kamado sold at that time. One of our readers sent us a sample so we decided to do a three way ash comparison between the three different charcoals. As you can see, the 2006 Thailand charcoal produced the same amount of ash as the new 2007 Indonesia charcoal, and both produced far more ash than the 2003 Philippine charcoal. To be exact, the Philippine charcoal produced 75ml of ash in this test, while the other two both produced 200ml of ash. So we guess the 2007 is "about the same as the old stuff" if you were referring to the 2006 Thailand charcoal. From left to right, 2003 Philippine, 2006 Thailand, 2007 Indonesia. All three samples weigh 260 grams. The three samples were burned side by side, at the same time. The difference in volume is again dramatic. Left to right, you can see the decline in the charcoal, 2003, 2006, 2007. Finally, due to the extraordinary circumstances surrounding this review, we decided to see if this charcoal actually could burn unattended for a long period of time in a a ceramic charcoal cooker. We loaded up a large Big Green Egg ceramic charcoal cooker with about 16 pounds of this charcoal and did the kind of burn that this charcoal is touted for, the low and slow cook. We wanted to see if this amount of charcoal would burn for 20 hours unattended like a cooker full of Royal Oak charcoal or the 2003 extruded coconut charcoal would. We found it could, but barely. The temperature was falling due to restricted airflow by the end of the cook. The primary reason the fire managed to stay alive as long as it did is that we used a convex grate which elevates the charcoal making more room for ash below it. The grate also tends to direct charcoal to the perimeter of the grate as it settles, so much of the ash piled up around the perimeter. You can see in the second photo what would have happened had all the ash fallen through the grate. You may find that your results will vary depending on the size of your cooker, the type of grate you use, and the shape of your firebowl. We loaded up the large Big Green Egg cooker with 16 pounds of charcoal. The ash produced would have filled the bottom of the firebox and completely blocked the airflow had we not been using a convex grate which elevates the charcoal and directs it towards the perimeter of the grate. Notice how crooked and uneven the briquettes are. Also notice the crack in the middle briquette. The holes are not centered and the hexagons are lopsided. 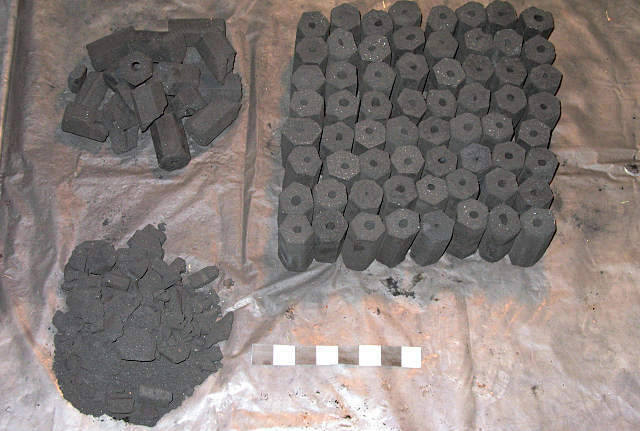 These briquettes, or logs, do not look like they were extruded under tremendous heat and pressure. They are crooked and uneven. We already know that the density of these new pieces is lower than the older charcoal. The cracks and numerous pinholes in the sides of the pieces also make one wonder about the process used to form them. We don't see these crooked shapes, cracks and pinholes in the old extruded coconut. This and the unusually high amount of ash produced makes us suspect that this charcoal contains a significant quantity of a binder. (All charcoal briquettes which contain binders produce enormous volumes of ash, so we feel it is a good bet this this charcoal also uses a binder.) 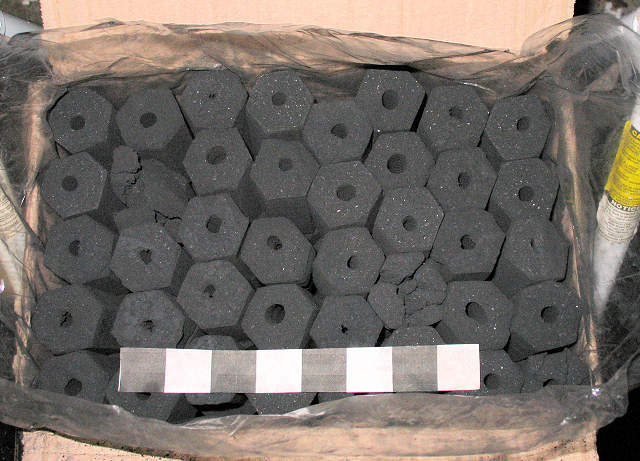 Basically, we suspect that this charcoal is the equivalent of charcoal briquettes, but instead of pillow-shaped briquettes that are formed in a mold, this charcoal is formed into hexagonal briquettes. 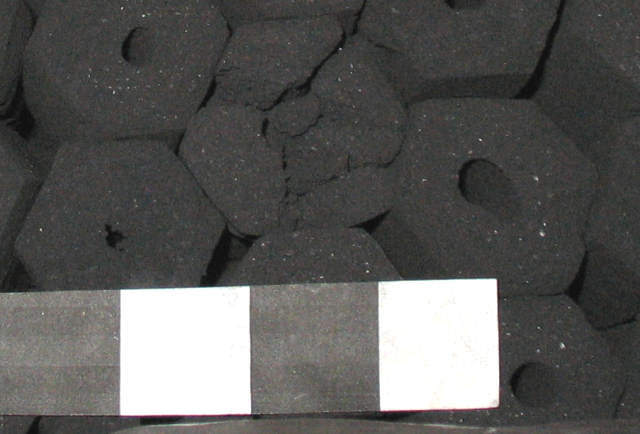 After researching information about the various ways that coconut charcoal is being produced in Southeast Asia, we suspect that this charcoal may actually be formed by merely placing the charcoal and binder into a hexagonal mold with a rod down the center, i.e., not extruded at all. In this method which molds the charcoal rather than extrudes it, a large amount of binder is required to keep the individual logs in shape. More binder would equate to more ash, and this charcoal certainly produces more ash. While we certainly don't know how this charcoal was produced, the molding process certainly fits with our observations. In addition, we found out that charcoal that is molded with large amounts of binder rather than being extruded is much cheaper to manufacture, and of course, Kamado sells this charcoal for $8 a box when four to five years ago they were charging $12 a box for the vastly superior Philippine extruded charcoal. Again, everything points to the molded charcoal possibility. This explains the wide variation in ash production and burn times between the different types of coconut briquettes that Kamado has sold. The different manufacturers who have been supplying Kamado with coconut briquettes have apparently been adding various amounts of filler to their products, despite Kamado's claims that their coconut briquettes contain no filler. It also explains how Kamado was able to reduce the price of their charcoal from $11.99 in 2003 for the high-quality Philippine charcoal to $7.99 in 2008 for their current low-quality charcoal. The fourth lowest burntime of all charcoals we have ever tested. Highest ash production of any charcoal we have ever tested, by a large margin. Higher than Kingsford briquettes. Very hard to light and very slow to get to high temperatures. Breaks down upon exposure to heat, so much of the charcoal cannot be used after the fire goes out. 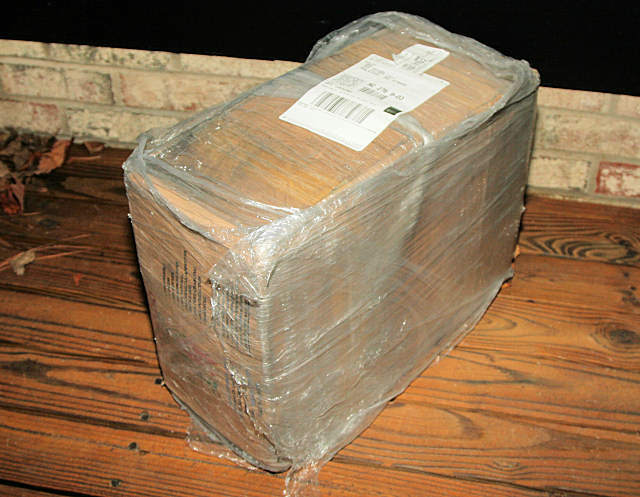 Relatively fragile and vulnerable to shipping damage. Expensive once you include shipping. (We paid $45 for our two boxes, believe it or not.) The only way to get an affordable price is to visit the Kamado forum and get in on a group purchase, a process which can take months and only works if you live near a group of people willing to collaborate. Unfortunately, this latest Kamado coconut charcoal product is a disappointment and it just barely gets our below average rating. What saves it from a not recommended rating is the fact that it does burn well for a low slow cook as long as you use enough and take into account the monstrous ash production. "Smokeless", "Ashless", "50% Hotter", "100% Natural (No chemical, additives or fillers)", "100% Pure Charcoal", "100% Satisfaction Guarantee", "Extruded Coconut Charcoal", "Made in Indonesia"
This is the contents of the box. Those are 1 inch squares on the measuring bar. well as the powder and small chips. This is how the boxes arrived. This is what a box looks like when you open it. Notice the plastic bag.